Ideal Contracting would like to congratulate our very own, Tim Rini, for receiving an Honorable Mention by the Association of Union Constructors’ (TAUC), judging committee for the James J. Willis Craftsperson of the Year Award. This award honors the men and women who bring the vision of a project to life, safely and professionally. Tim Rini managed to do just that for the office renovations at GM Milford Proving Grounds. Made up of more than 2,000 contractor companies, TAUC uses union labor for projects along with local contractor associations and vendors in the industrial maintenance and construction fields. Their mission is to advocate for union contractors and enhance the cooperation between the three entities involved in the successful completion of construction projects. Tim brings over 25 years of work experience as a carpenter to Ideal Contracting and has been the lead carpenter since joining Ideal three years ago. As lead carpenter, Tim’s days consist of overseeing workers on the job to insure that every project runs smoothly and safely. 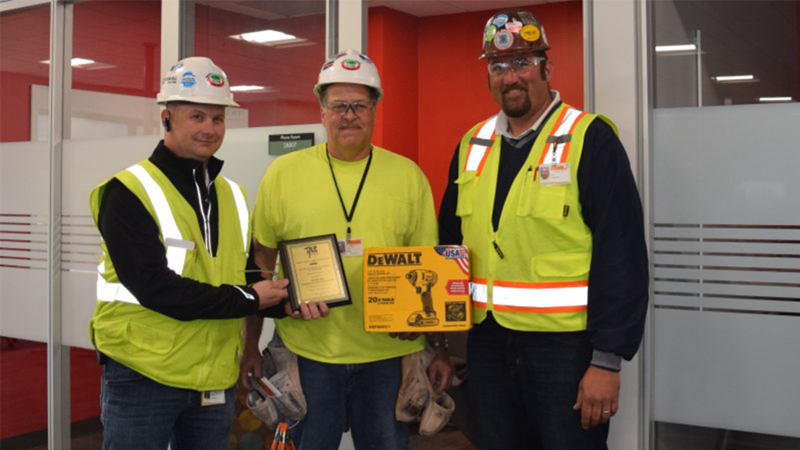 The highlights of the office renovation project at Milford, for Tim, are how he is able to oversee multiple trades working together and watching the project develop from start to finish. Tim has been part of the office renovations for Buildings 1-5, 70, 31, 7, 16, 104, 54, and 24 at Milford. When Tim is not at work, he spends time with his wife on their 40 acres where they enjoy planting a variety of trees and plants. “Ideal Contracting consists of the best people and is the best company I have ever worked for in my 25 years as a carpenter,” said Tim. “They truly do care about you and will go out of their way for you.” Tim brings great energy and enthusiasm to the Milford team and we truly appreciate his dedication to Ideal Contracting.